Psychiatrist Andrew Marlowe has a perfectly ordered life – solitary, perhaps, but full of devotion to his profession and the painting hobby he loves. This order is destroyed when renowned painter Robert Oliver attacks a canvas in the National Gallery of Art and becomes his patient. Desperate to understand the secret that torments this genius, Marlowe embarks on a journey that leads him into the lives of the women closest to Oliver and a tragedy at the heart of French Impressionism. Kostova’s masterful new novel travels from American cities to the coast of Normandy; from the late nineteenth century to the late twentieth, from young love to last love. 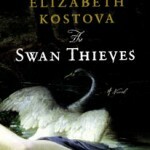 The Swan Thieves is a story of obsession, history’s losses, and the power of art to preserve hope. This was a beautiful book. I enjoyed it thoroughly. I liked the way the author managed to combine art with pyschology and the past with the present. It brought back to mind ‘The Time Traveller’s Wife’ by Audrey Niffeneger. Not that it was in any way the same,but the two different stories within The Swan Thieves, which were connected by a love story was reminiscent of The Time Traveller’s Wife. (If you didn’t enjoy it, don’t be swayed by my thoughts). The second novel by Elizabeth Kostova, her first being ‘The Historian’ are similar in that they combine the past with the present, but whereas I felt ‘The Historian’ was quite eerie (for my review head here) her second one was beautiful and filled with a type of longing. Sadness too but definitely less intense. I can certainly recommend this book, I think it is the perfect read to take you away to the distant past. It is a quiet book with none of the immediacy of The Historian and perfect to curl up with and savour.